Below is the thinking behind creating this system and a class to go along with it. Here is the link to the OGL stuff featured the spell casting table based on the Turn Undead mechanic. I've always been a sucker for alternate abilities for Turn Undead. I absolutely love the Priests of Different Mythoi in the 2e rules. So when I read this post from +Nathan Irving, I left behind yet another spell point system to study and opted for something different. The main idea is: How can the Turning Undead mechanic be used for spellcasting? 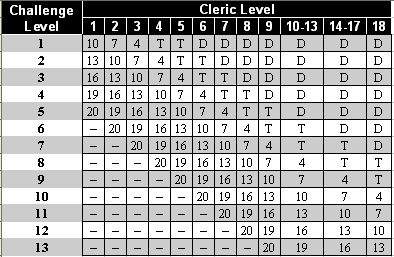 When a Cleric attempts to turn undead, the player should roll 2d10 and consult the following table for the result. If the number on the dice is equal to or greater than the number shown on the table, 2d6 creatures of the targeted type are turned and will depart, not returning for 3d6 rounds. If the table indicates “T,” 2d6 undead creatures of the targeted type are automatically turned and will depart for 3d6 rounds. If the table indicates “D,” 2d6 of the undead creatures are automatically destroyed and will crumble to dust. Rolling 2d10 for success, there is going to be a big, noticeable curve in success rates. 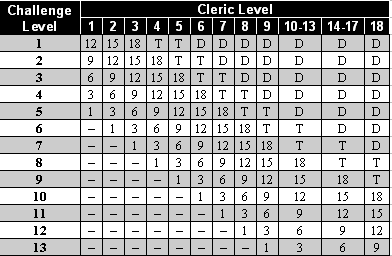 See how the numbers go down quickly for a 4th level Cleric? 100 percent for Undead with a Challenge Level of 1 (Skeletons). 97 percent for Challenge Level 2, but the 85 percent for level 3, only 64 percent for Challenge Level 3, and then a dive to 36 percent for Challenge Level 4. 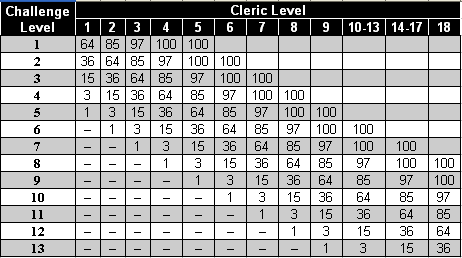 You get the sense that there's a definitely sweet spot for success, depending on the Cleric's Level. One other thing to keep in mind is that there is no penalty for an unsuccessful attempt. Sure a 4th level Cleric has only a 1 percent chance to turn an undead creature with a Challenge Level of 8 (typically a Mummy), but you have nothing to lose for the attempt. Spellcasting works the same way. In the rules as written, there's no chance to cast a spell incorrectly, so casting a spell, as long as you have it in your spell book, has no risk. Fire and forget, as many others have said. A 1st Level spellcaster could attempt a 4th level spell. Without a risk to attempt it, there's no reason any self-respecting player wouldn't attempt to hurl an Ice Storm or use Charm Monster. This works in certain campaigns and I'd have fun with it, but I want something closer to the standard Magic-User. Turn Undead can be used as often as you like. When using it for spellcasting, that would mean at certain levels, a spellcaster could fire off spells at-will without limit, so I wanted to think of ways to limit the number of spell that could be cast. Using a spell point system felt like it was moving away from the original goal of just using the Turn Undead mechanic. I'd be using the Turn Undead mechanic to track whether or not a spell was successfully, but then adding a brand new mechanic to track the number of spells being cast. I determined that this was unacceptable. Why a roll-under? I could add a +1 to the roll after every attempt. After casting a few spells, it would become impossible to successfully cast a spell. I'll explain this more later. After converting the Turn Undead mechanic to be a roll-under mechanism, I put the spellcaster level and Spell levels back in as I had before. I have a simple way to manage the number of spells cast, but there's still the problem of that 1st level character launching an Ice Storm. To mitigate that, I'll have to cut off the spell level that can be attempted. So, looking at the Magic-User tables, I cut off higher spell level that could be attempted. In other words, a 2nd level spell could not be attempted until the spellcaster reached 3rd level. Mert the Magnificent is a 7th level spell caster. He attempts to cast a 1st level spell. Rolling 2d10 is pointless as he has to roll under a 21. It is an automatic success. Later, however, he wants to cast Magic Missile, another 1st level spell. Since he has cast one spell before, he adds +1 to the roll. It is still automatic, but with the +1, it is possible to roll a 21. Each successive spell attempt adds +1 to the roll. Now lets look at what happens when he wants to attempt to cast a spell one more time. Since he has already cast two spells, so +2 is added to the roll. Regardless of level, he no longer has automatic success. Here's another thing, the +2 applies to any spell attempted, regardless of level. Casting spells this way makes all attempts more difficult. With tweaks applied, I was happy with the system. Lower level spellcasters using this system are more powerful early on, but they become much weaker at higher levels. For example, a 20th level Magic-User can hurl a total of 50 spells ranging in level from 1 to 9. At the absolute maximum and with some incredible dice rolling, a 20th level spellcaster using this system can throw 39 spells. So, I wanted a spell failure table. There has to be a reason to prevent spell casters using this system to avoid hurling spells until the run out. After all, if a spell caster can throw up to eight spells at first level, it doesn't fit well with existing classes. I didn't have time to generate one. I'll add that in a later post. With consequences for failure in place, the resulting spellcaster is now weaker on average after 4th level. At higher level, the difference is stark. A 20th level spell caster using this system may go quite a long time without casting a 9th level spell because if he cast a few 1st level spells earlier in the day, it becomes too risky to hurl an 8th or 9th level spell. As much as I love how that works, it makes the spell caster much weaker than a standard Magic-User. So I decided to create a class that uses this system, but also has some "guaranteed spells" to use. I call this class a Sorcerer. Looking at the Magic-User spell table, I basically divided it in half, rounding down. I'm out of time, but I will say that I am very happy with the result. At 1st level, a Sorcerer doesn't have a guaranteed spell, but he has a chance to cast a 1st level spell. At 3rd level, he doesn't have a guaranteed 2nd level spell he can cast, but he can attempt to cast it using the table above.